Most runs at Games Done Quick events fall in the one to three-hour range. 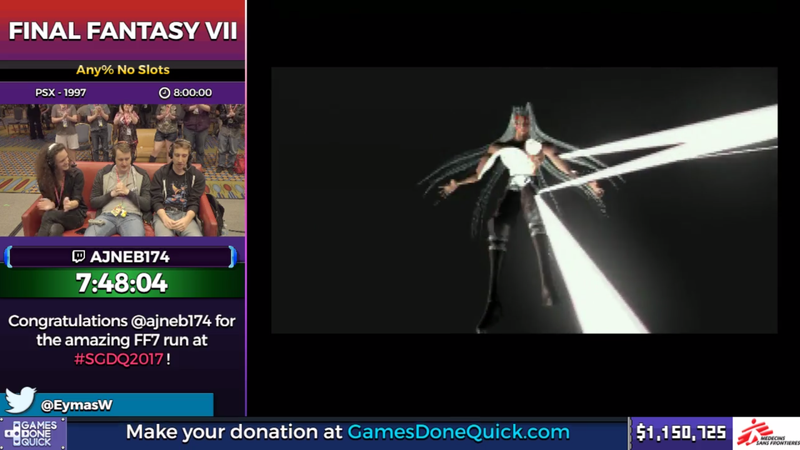 Last night, Final Fantasy speedrunner “Ajneb174,” or Ben, put on an almost eight-hour speedrun of Final Fantasy VII, an endurance run of memorization, routing and insane game knowledge. Joined on the couch by fellow Final Fantasy runners Davesterio and J2_JATWo, the three settled in for the long overnight haul in Minneapolis, Minnesota. One of the longest single runs Games Done Quick has accepted in some time, the three on the couch had a lot of work ahead to guide an audience through a massive speedrun (starting at 12:51:00 in this Twitch VOD). And in fairness, eight hours for Final Fantasy VII is incredible—HowLongToBeat puts VII at an average of 38.5 hours for a main story run, the “Any%” these runners were aiming for. They were also playing under the No Slots category, which meant no using Cait Sith’s “Slots” ability to one-shot enemies. To make this run marathon-safe, or comfortable enough to finish with less chance of run-ending circumstances, the three runners had to do a lot of re-routing and practice to make sure the exhibition went well. Even early on, the runners go over minor details they track throughout the game, like the number of steps Cloud takes. The random encounter mechanic in Final Fantasy VII, they explained, is tied to the in-game step counter, and so they can manipulate it to skip certain fights and avoid disadvantageous encounters. Optimizing fights, counting steps, the night dragged on into the wee hours of the morning. The trio persevered, never losing steam and carefully tracking through their planned route. As the sun likely started to rise in Minnesota, the runners pulled a practical joke on the audience when they pretended that Ben, the main runner, had accidentally killed the party and ruined the run almost six hours in. And of course, the infamous Aeris scene. (Final Fantasy VII spoilers follow, if you’re one of the few who doesn’t know yet.) The trio did an excellent job of explaining the lore and story of the game as they played through, even noting subtle details in scenes that longtime players might miss. They held off from mentioning the scene where Sephiroth kills Aeris, however, and the moment when it happens is fairly priceless. Judging from the voice, that’s popular speedrunner SpikeVegeta crying “why” in the background, made better by the fact that viewers donated for his screenname to be Cloud’s in-game name. It all culminated in the final fight between Sephiroth and Cloud/SpikeVegeta, where one Omnislash capped off the eight-hour marathon. Also, no bathroom or food breaks. Major props for that. If you want to spend your Saturday watching the entire run, the VODs will upload later to GDQ’s YouTube channel, or you can jump to the 12:51:00 mark in this Twitch archive. Summer Games Done Quick caps off today with runs of Super Mario 64 and Majora’s Mask, leading up to tonight’s finale, Earthbound.